Believe it or not, the picture you're looking at isn't a miraculous string of stars that just happen to spell out the name of this humble blog. In fact, it's an image generated from a huge database of galaxies analyzed by citizen science project Galaxy Zoo. Launched in 2007, Galaxy Zoo has over 250,000 users who help classify galaxies. As a result, the project has a rich database of galaxy images, all nicely tagged with features. 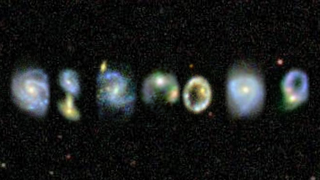 Now, one of the members of the Zoo team, Steven Bamford of the University of Nottingham, UK, has used the image database to generate a galactic font.